Motto: Decerptae dabunt odorum (Roses plucked will give sweet smell). The Clan name, and its deirvation, Ayton, probably come from the lands of Ayton in Berwickshire, and the name is believed to mean a town on the river Aye. An Anglo-Norman knight, Gilbert, obtained these lands in the eleventh century, and took the name as his own designation. Steffan son of Swan de Aeitun granted lands to Coldingham Priory, around 1170. The family lands, however passed out of the principal line when an heiress married George Hume, and the rights passed to him. James, son of the sixth Earl of Hume lost these lands in 1715 due to his support for the Jacobite cause Andrew Ayton, son of the house of Ayton of that Ilk, is listed as a Master of the King's Works who therefore purchased valuables for the King, as well as collecting tax, and finacing the Master of Artillery. The poet, Sir Robert Ayton acted as both ambassador to the German Emperor, and as secretary to the wife of Charles I, Henrietta Maria. Arms: Argent, a cross engrailed between four roses gules. 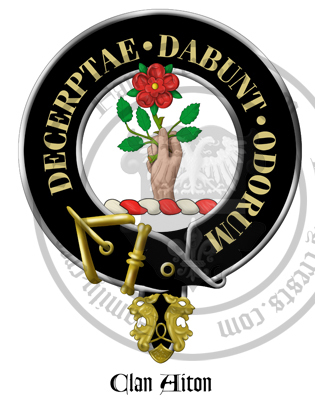 Motto:Decerptae dabunt odorum (Roses plucked will give sweet smell).